Freeport and Boothbay Region also capture regional titles. CUMBERLAND — The thought that the Scarborough boys’ cross country team might be upset Saturday in the regional championships was squashed quickly. 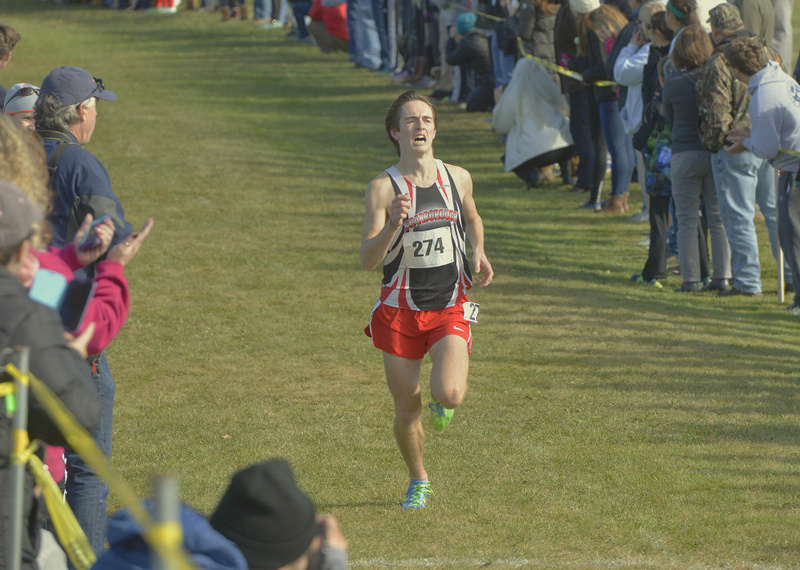 Colin Tardiff won the Class A South race in 16:39.54, Connor Doherty followed in second (16:46.21) and Andrew Sholl was third (16:47.35) as the Red Storm cruised to the team title at Twin Brook Recreation Area. They will get a chance to defend their state title on this same course next Saturday. Other team champions were Freeport in Class B and Boothbay Region in Class C.
Besides Tardiff, the individual winners were Luke Laverdiere of Yarmouth (16:32); and Nicholas Harriman of Lisbon (16:56.73). The top 30 individuals and top 50 percent of the teams in each class qualified for next Saturday’s state meet. Scarborough won Class A with 45 points to Falmouth’s 71. The Red Storm also had Andrew Goodwin (13th) and Luke Grover (26th) as part of the scoring. But it was the top three that showcased the Red Storm’s dominance. The Red Storm are always in contention for the team championship, and Tardiff is relying on his team’s experience. “We can’t be too cocky going in,” Tardiff said. “If we do that, we could relax too much during the race and something unexpected could happen. Falmouth’s Sean Soucy finished fourth and Gorham’s Jesse Southard was fifth. In the team scoring, Windham finished third (led by Ben Breton’s eighth place) and Westbrook was fourth (led by Joshua Lombardo’s sixth-place finish). Deering, Marshwood, Biddeford, South Portland and Gorham also qualified for the state meet. In Class B, Laverdiere won by three seconds over Greely’s Ryan Morrison, who sprinted in to pass Freeport’s Chandler Vincent for second in 16:35. Vincent finished in 16:35.36 and his teammates kept on coming, led by Henry Jaques in fourth (16:38.13). “Those two have been strong all year,” Freeport Coach Brian Berkemeyer said. But he was also happy with Erik Brobst (sixth), Alex Les (15th) and, especially, Tom Doyle (31st). Freeport totaled 59 points to 78 for second-place York (led by Alex Brockelman’s eighth-place finish). York edged Greely (79 points), which was led by Morrison and Kyle Hansen (fifth). The other state qualifiers included Yarmouth, Cape Elizabeth, Wells and Gray-New Gloucester. In Class C, Boothbay edged Lisbon, 92-98. Boothbay had five runners in the top 26, led by Kyle Ames (10th). Winthrop, Monmouth Academy, Maine Coast Waldorf, Old Orchard Beach and Waynflete also qualified for the state meet. Willson Moore paced Waynflete with a fifth-place finish. Old Orchard Beach was led by Josh Martin (seventh place) and Maine Coast Waldorf’s top finisher was Tucker Pierce (eighth).